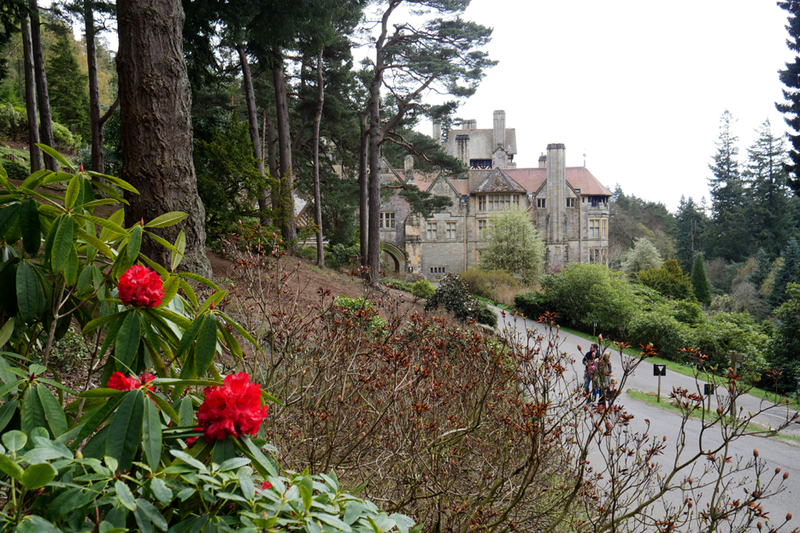 " Northumberland - 4 - Cragside "
Places visited : Cragside House and Grounds Rothbury, Northumberland. 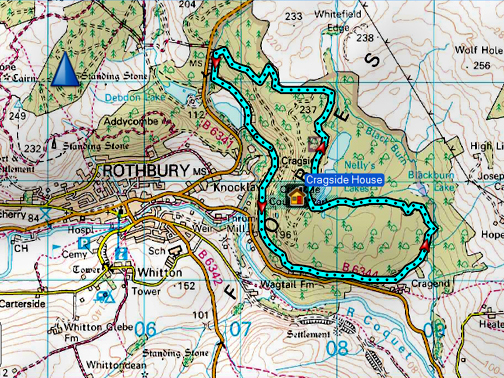 Walk details : A local walk in the grounds plus a drive round the estate. Weather : Sunshine and high cloud at first, but ending with a few spots of rain. 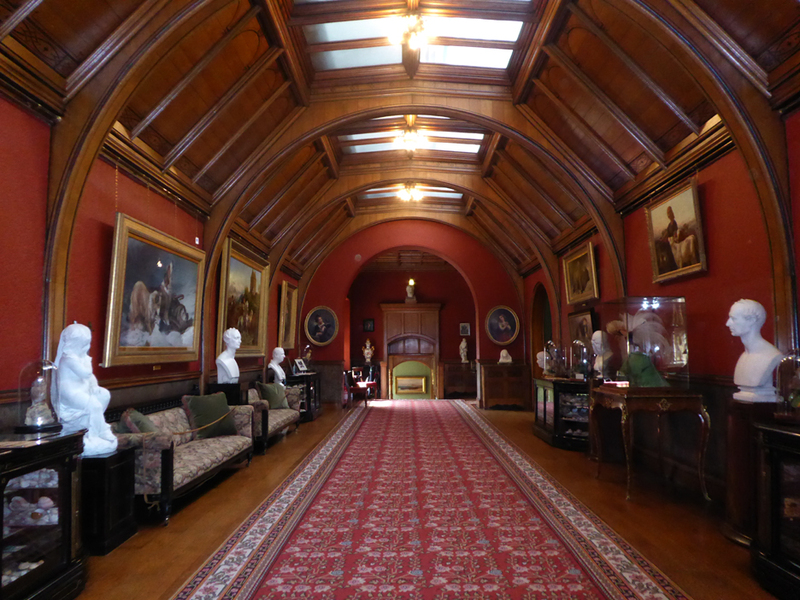 but today we venture inland to a National Trust "Stately Home" which is an unusual outing for us. with only the inside of the grand house out of bounds for dogs . . . altogether a great place to visit. We will go on their recommendation ! The bright moon last night . . .
. . . and sunrise this morning. 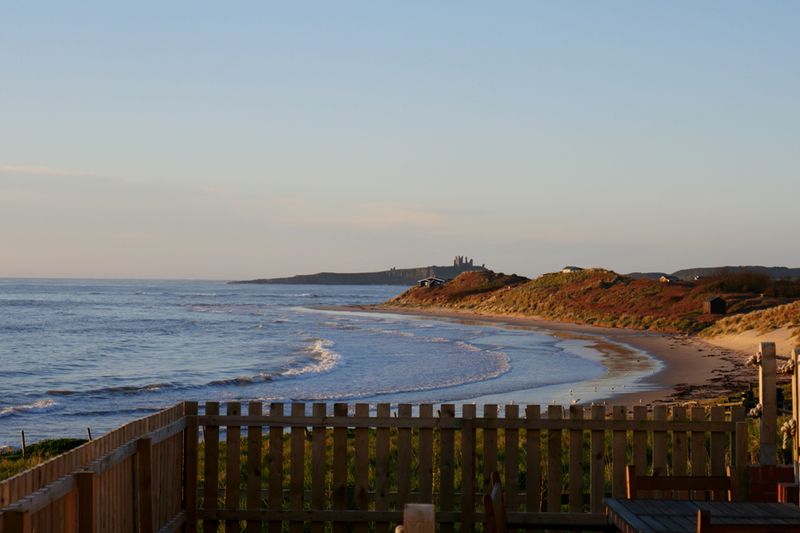 It was a lovely start to the day as this view of Dunstanburgh Castle from our cottage holds testament. 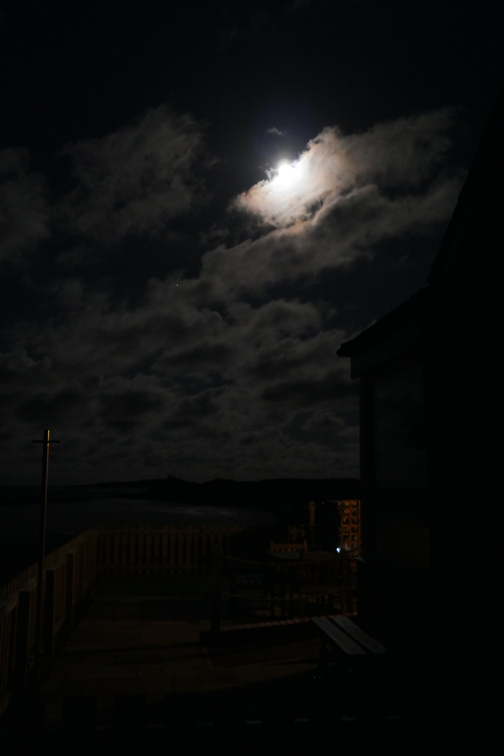 After being woken by the light at something past five, I took a few pictures and retired to bed once more ! 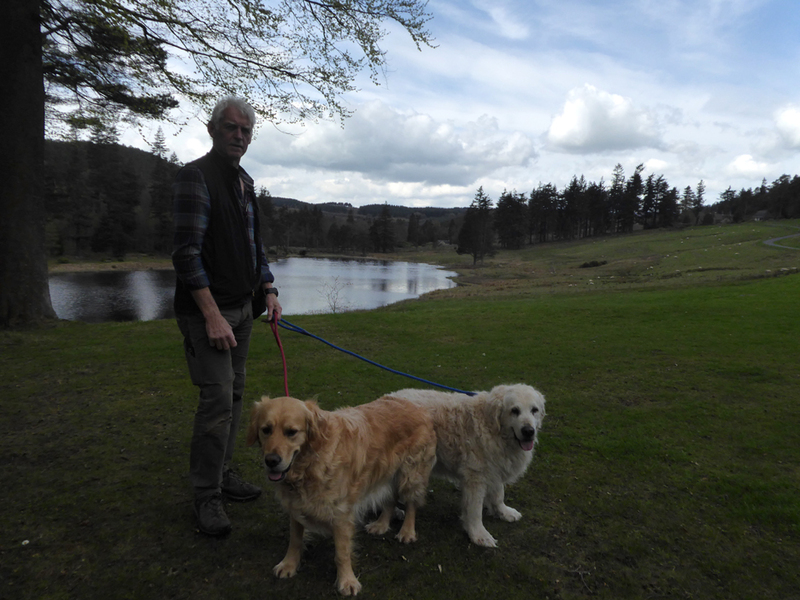 we headed out on a forty minute drive towards Harwood Forest and the Cheviot hills. 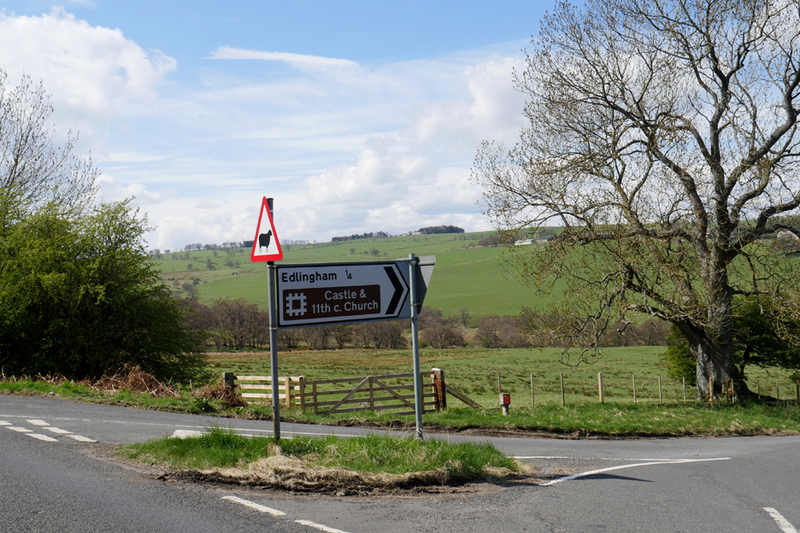 A fine Northumbrian landscape . . . worth stopping the car in order to look at the view. which found us looking across at a classic agricultural landscape complete with an old castle, an old village and an old railway track. That will be the name of the village then. 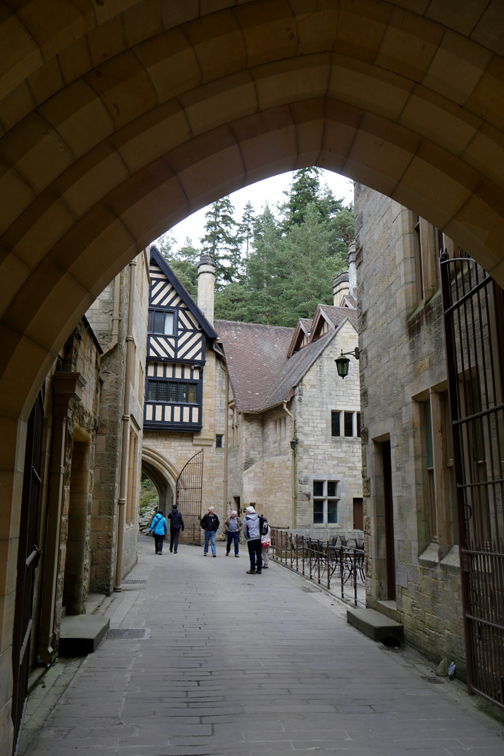 and turn into the entrance of the Cragside Country Park. 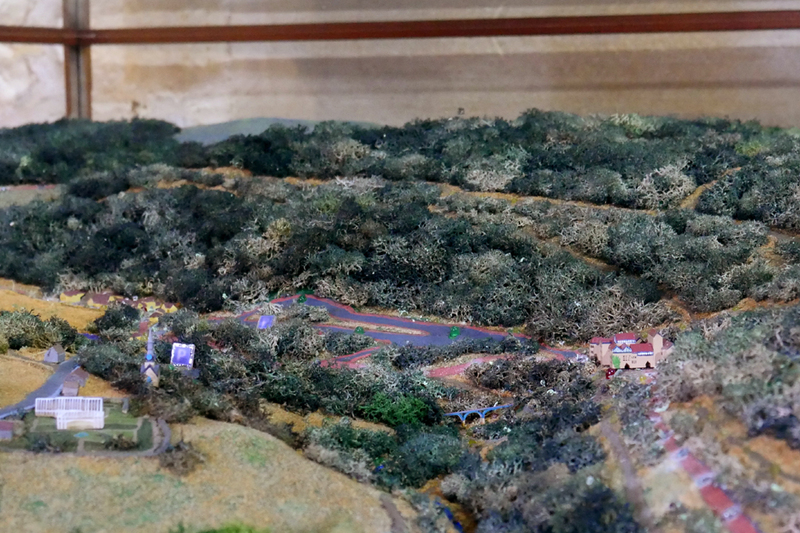 The public was well catered for with large parking areas and good access roads. Details of what there was to see, or what was going on each day was available at the entrance or at the small information centres. 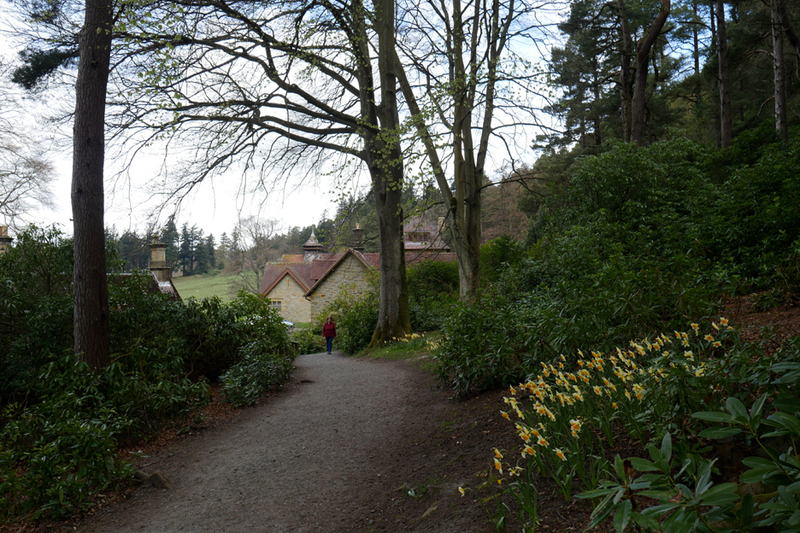 Ahead, through the trees was Cragside House . 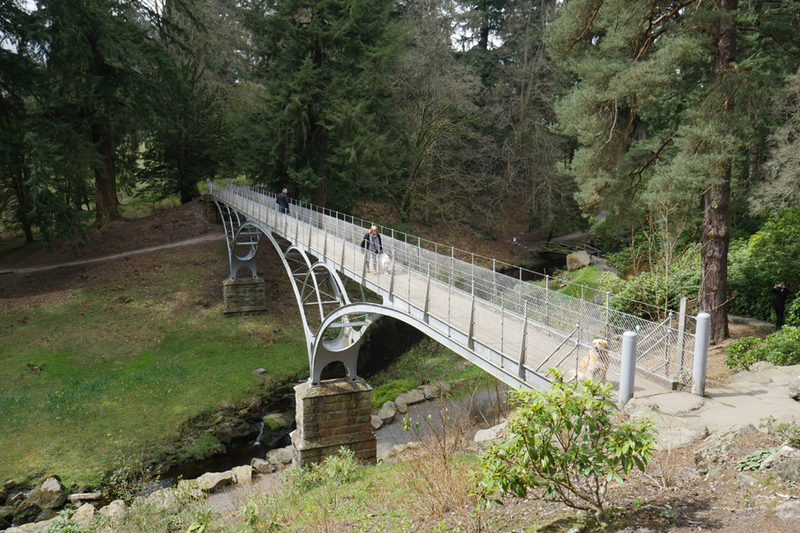 . . built by the late Lord Armstrong, the well known Victorian engineer. "taking the scenic route" to get to the house . 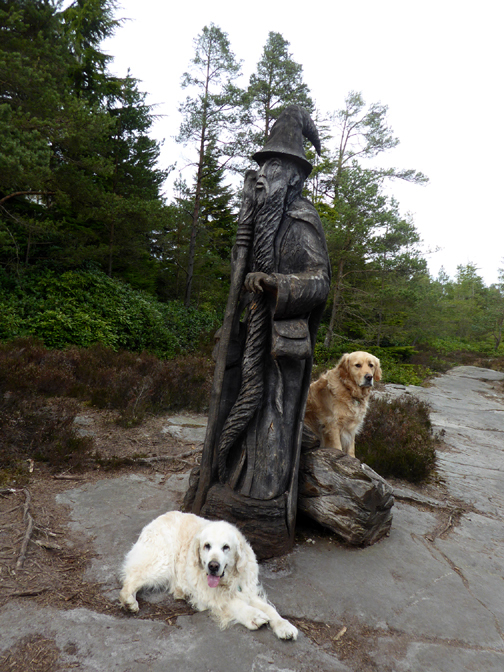 . . and giving the dogs some exercise along the way. 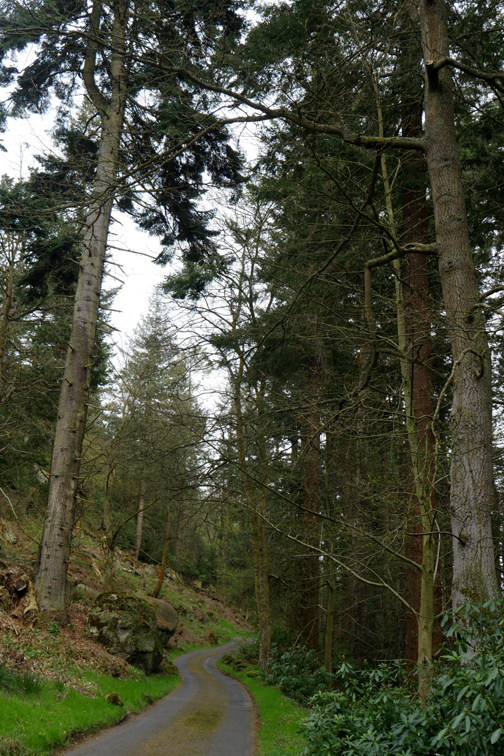 Leaving the car park on the woodland path . . .
. . . these were seriously tall trees, all planted by the Armstrongs. 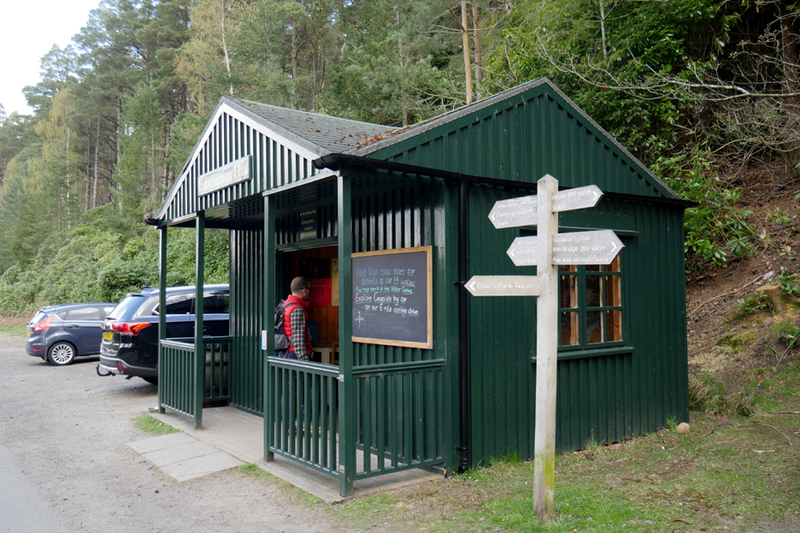 Ahead was the main visitor centre and cafe, set in the edge of the woodland slightly away from the main house. 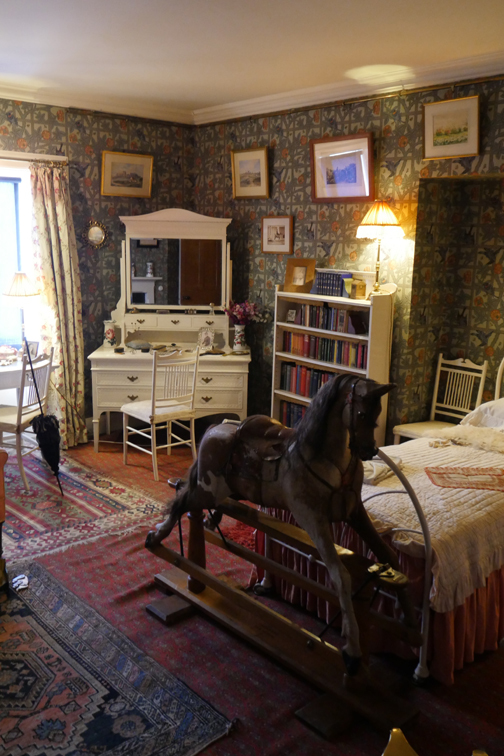 It would have been the 'home farm and stables' at the time that the main house was lived in. and the entrance to the cafe with space for eating out under the verandah if needed. 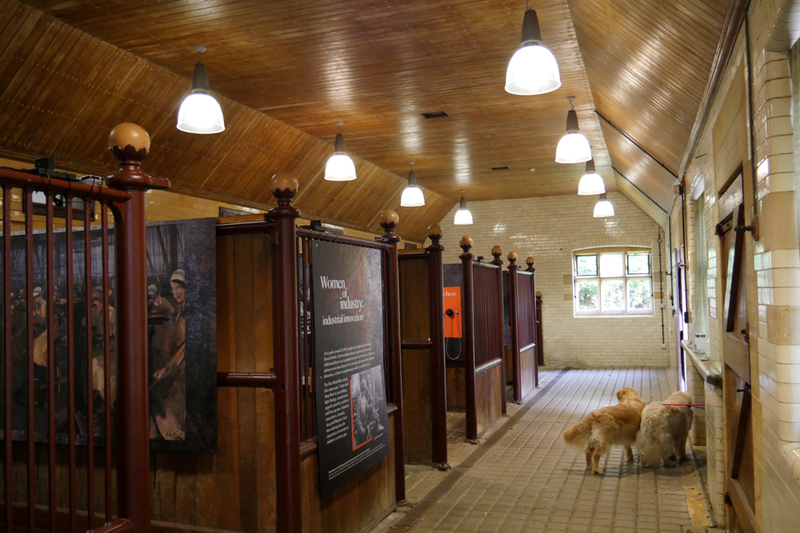 In the stable block there was an informative display about the family and the society at that time. 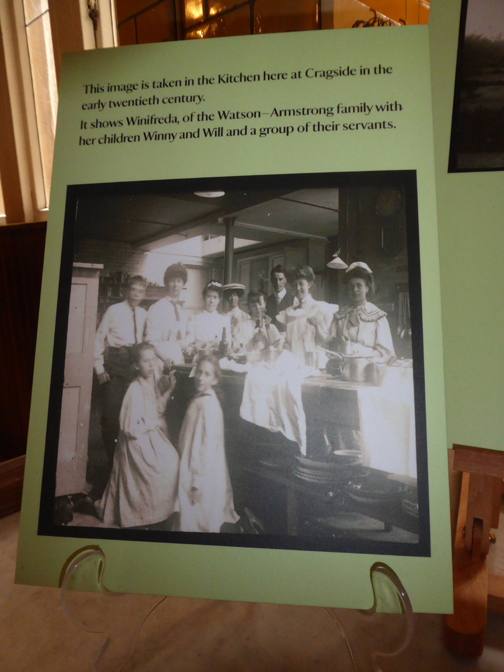 Part of the display featured "Women in Industry" and how they were employed in the Armstrongs companies. 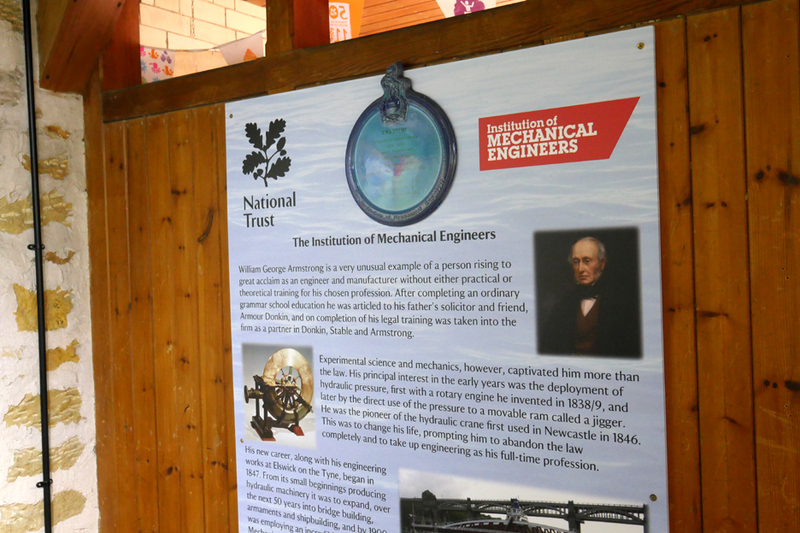 The importance of the man as a pioneering engineer was documented in another section. good to get your bearings if you needed. Myself , Dylan and Harry by Tumbleton Lake, just down from the Visitor Centre. 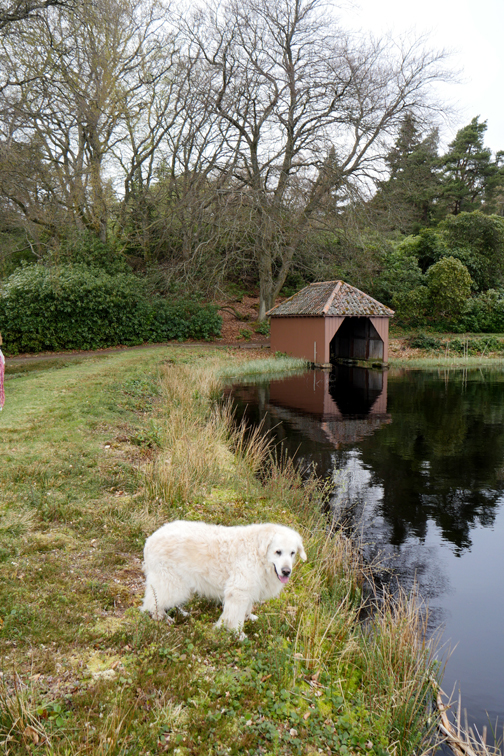 The lake is a reservoir and part of the grand scheme for utilising water and water power on the estate. utilising the water from Tumbleton Lake. 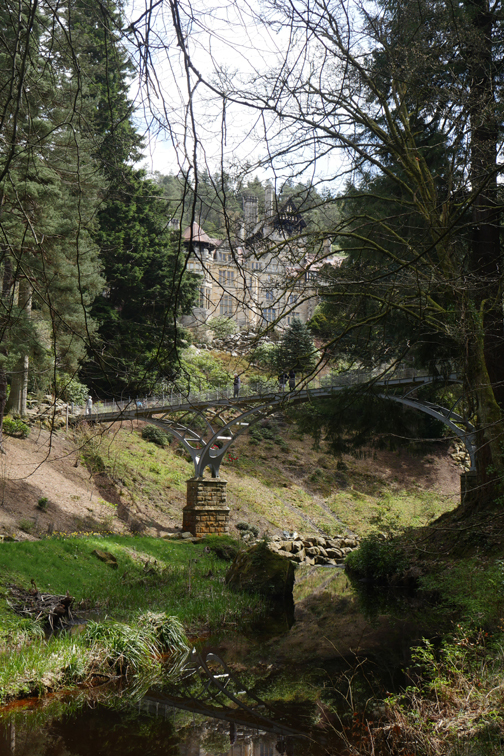 Cragside is once again powered by hydro-electricity. 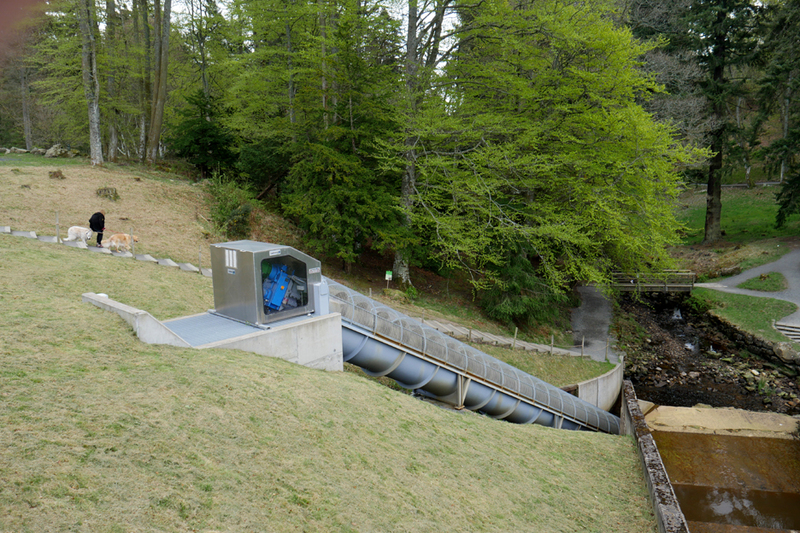 A view of the water shute containing the Archimedes screw and the (blue) generator which produces the electricity. 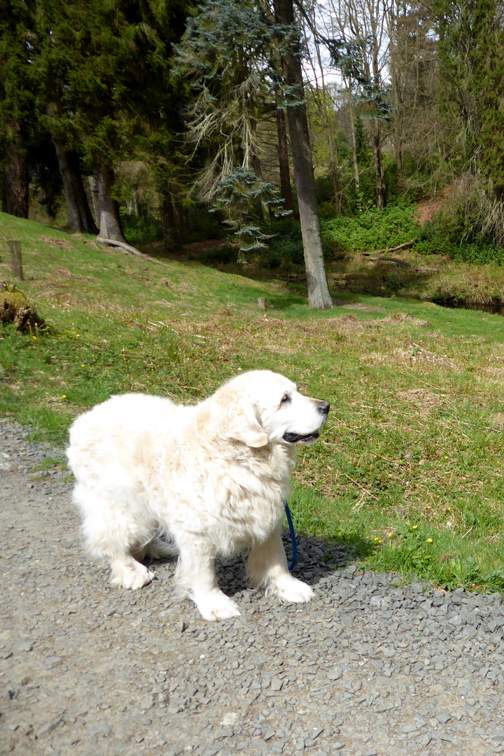 We walk down past the old Pump House and follow one of the trails down, alongside the stream. 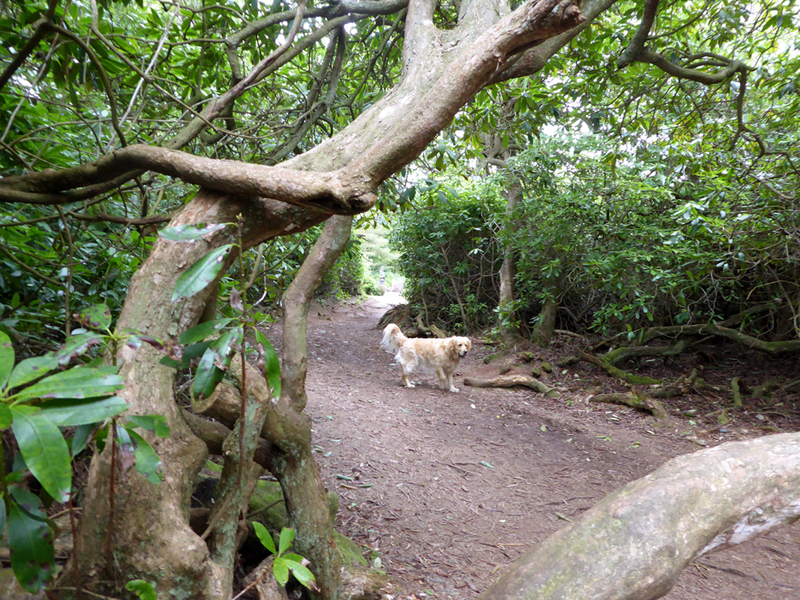 Harry is coping with this easier walking . . .
. . . but appreciates the rest as we stop to admire the trees. 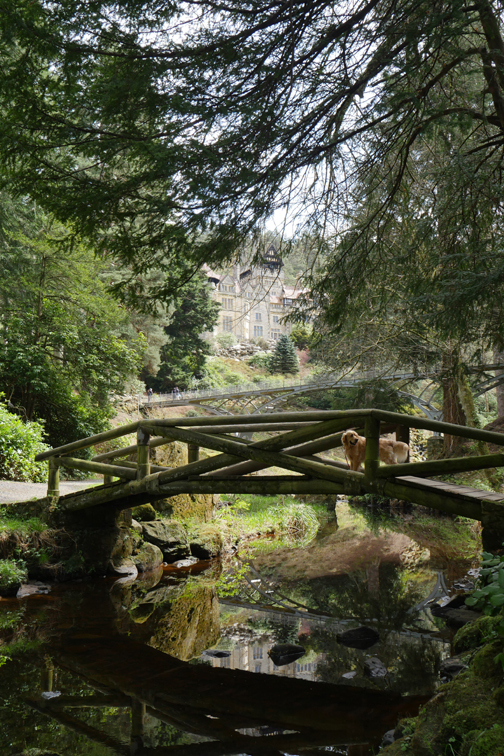 Dylan tries out the old wooden bridge . . .
. . . but we'll cross on the spectacular Iron Bridge to reach the house. 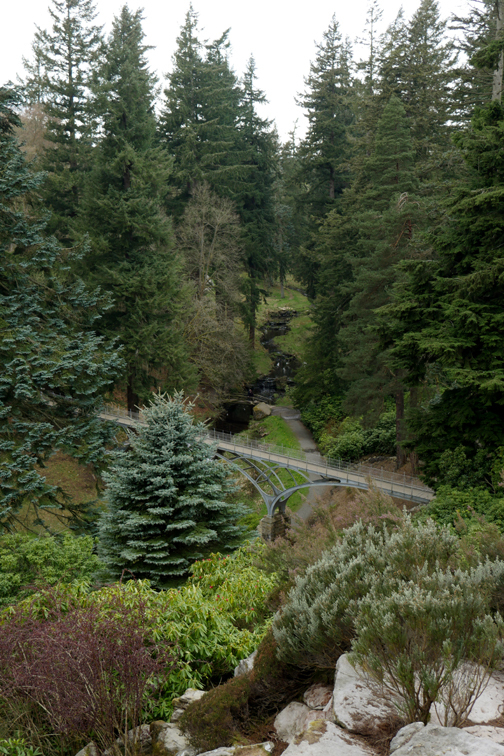 Crossing the Iron Bridge brings you to the start of the steps up through the rock garden, towards the house. A rock garden with proper rocks ! 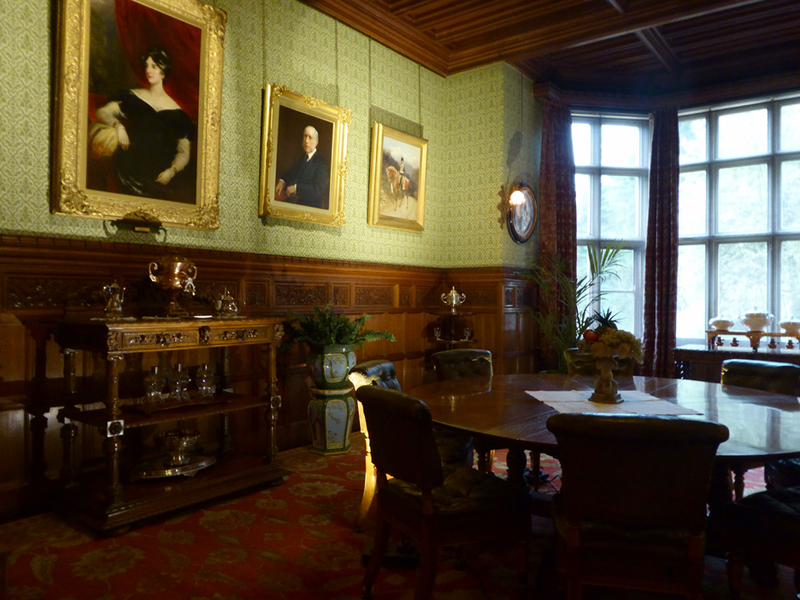 which Lord and Lady Margaret Armstrong created out of the profits of their industries. and was extended many times. to explore the rich detail and learn of the history. 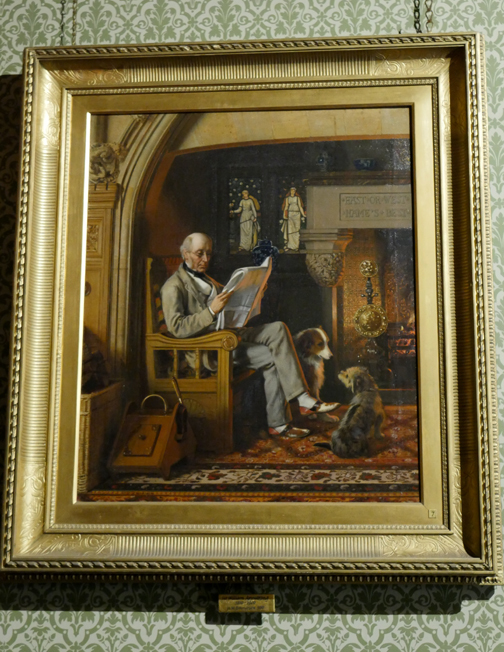 of the Victorian age." NT. and a bowl of water for the dogs. 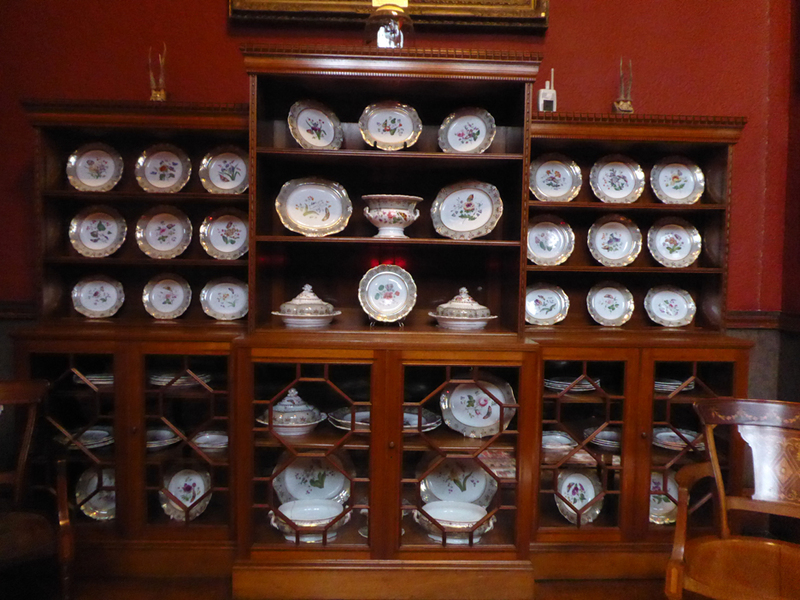 so Ann and I took turns to look after them as each of us visited the house. 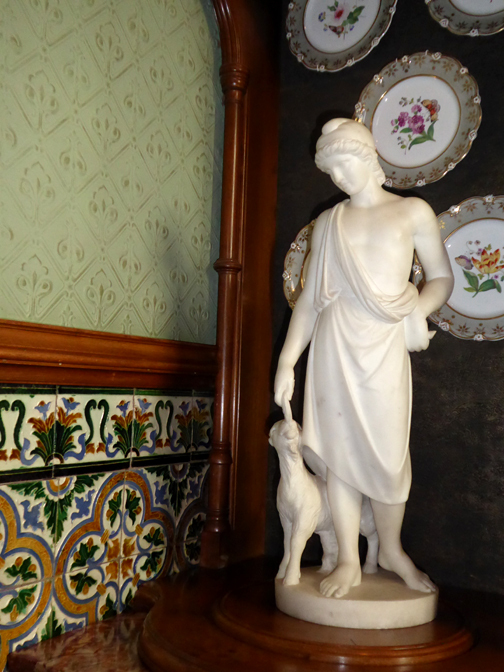 I'll leave the detail explanations to a minimum as we walk around the house. 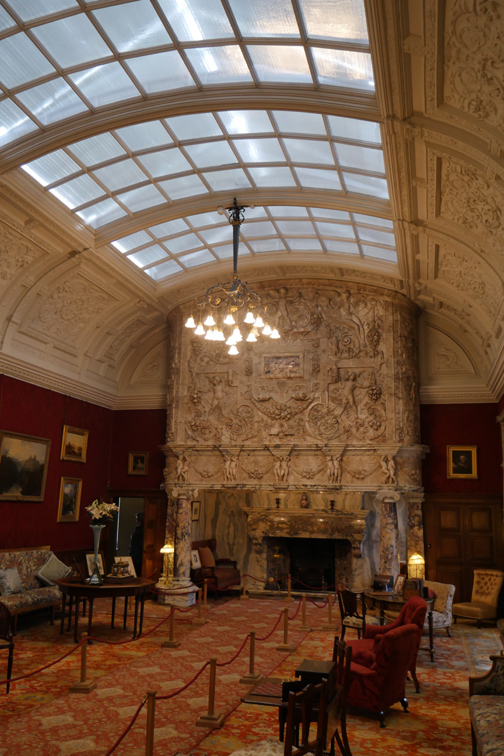 The main entrance lobby . 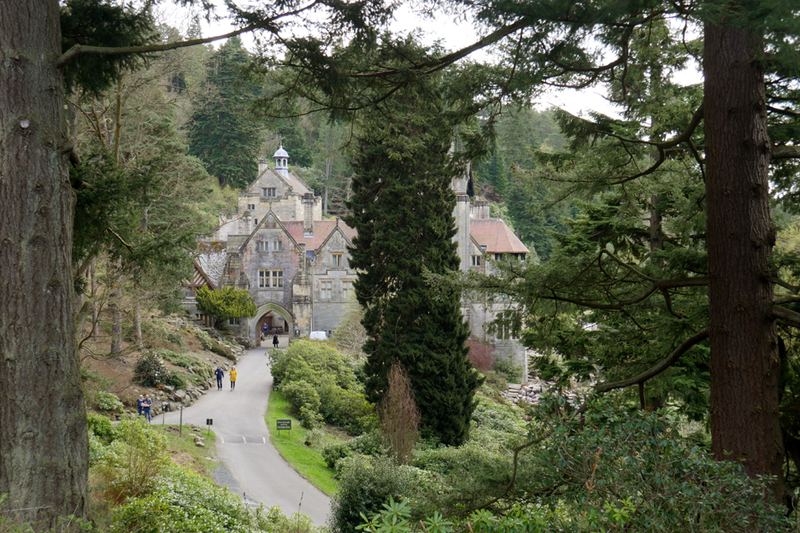 . . entrance is free with National Trust membership. 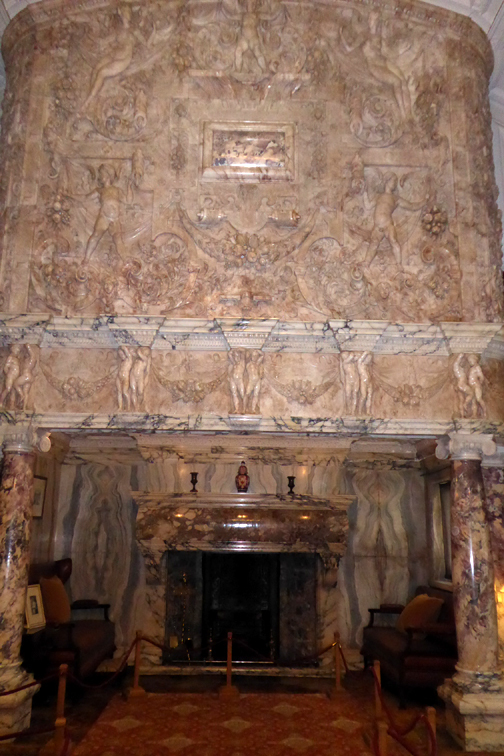 adorned with paintings from the time. 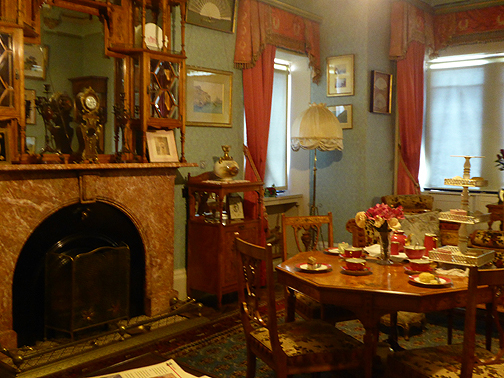 and seated below the very same arch and fireplace.
. . . and the sitting room in the newer part of the house. 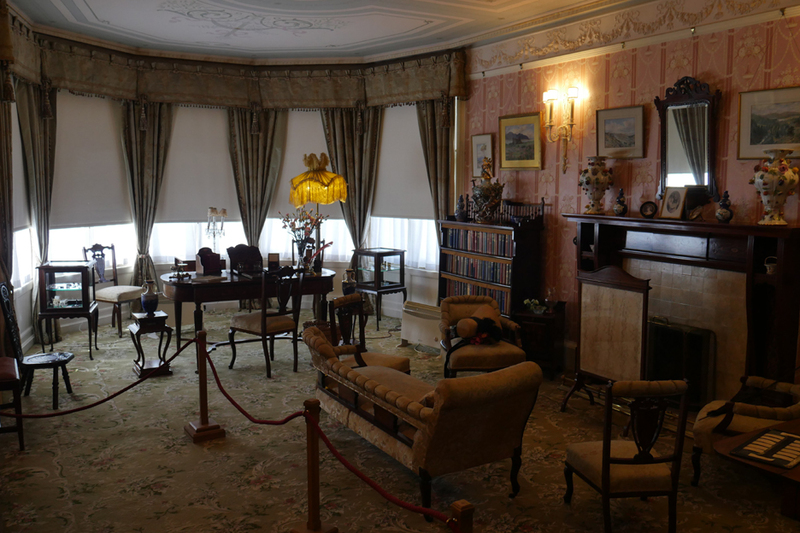 I believe the old sitting room became known as the library. 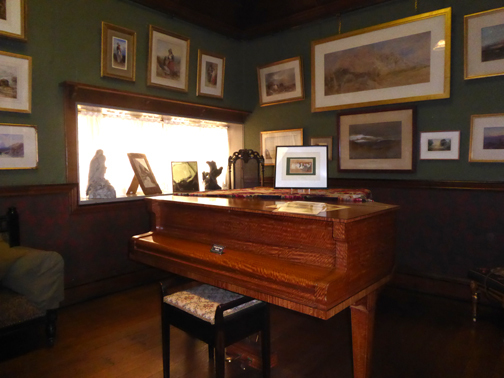 The Ladies Sitting Room . . .
. . . and the Music Room. 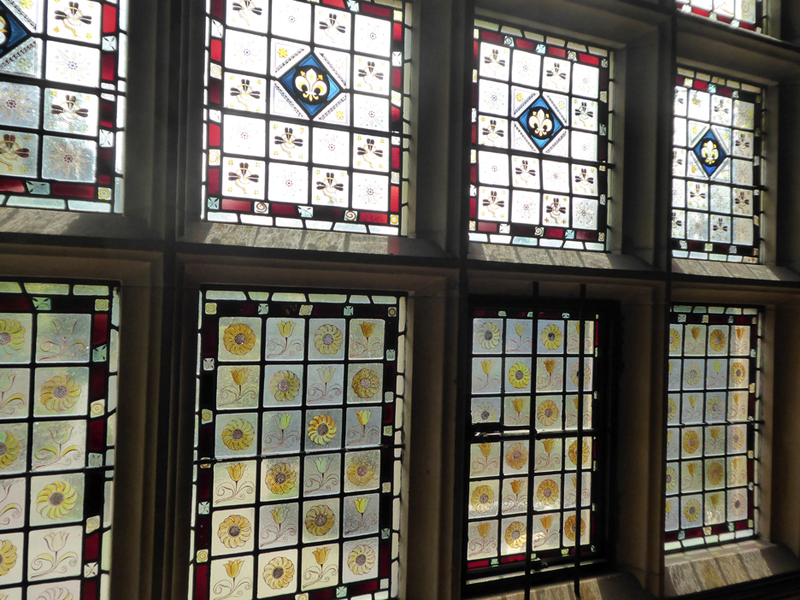 The house included some lovely stained glass windows which lit the rooms and provided privacy from outside. 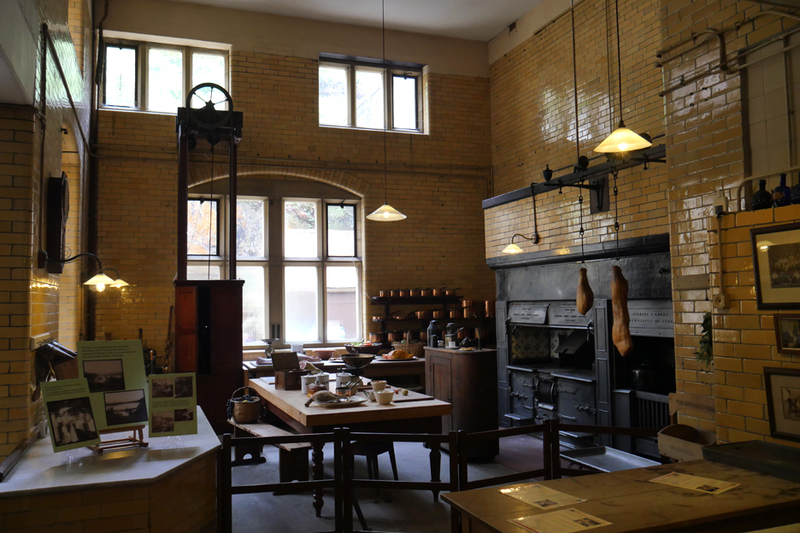 The famous kitchens complete with original equipment and power driven rotisseries in front of the big cooking range and fireplace. 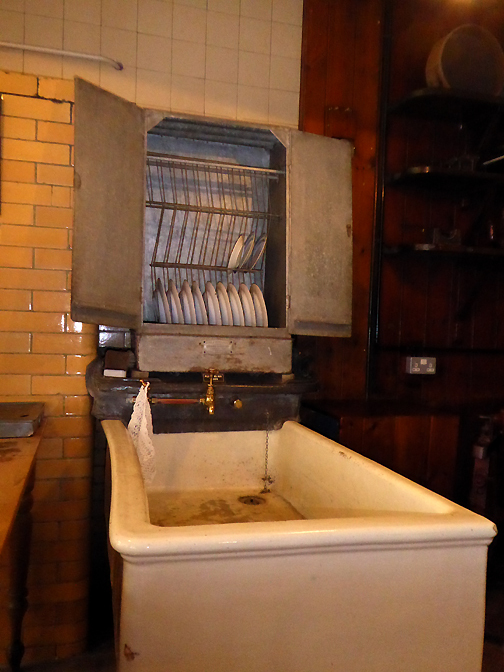 The box furniture with the wheel and cable is a 'dumb waiter' to transfer clean and dirty dishes to and from the scullery below. 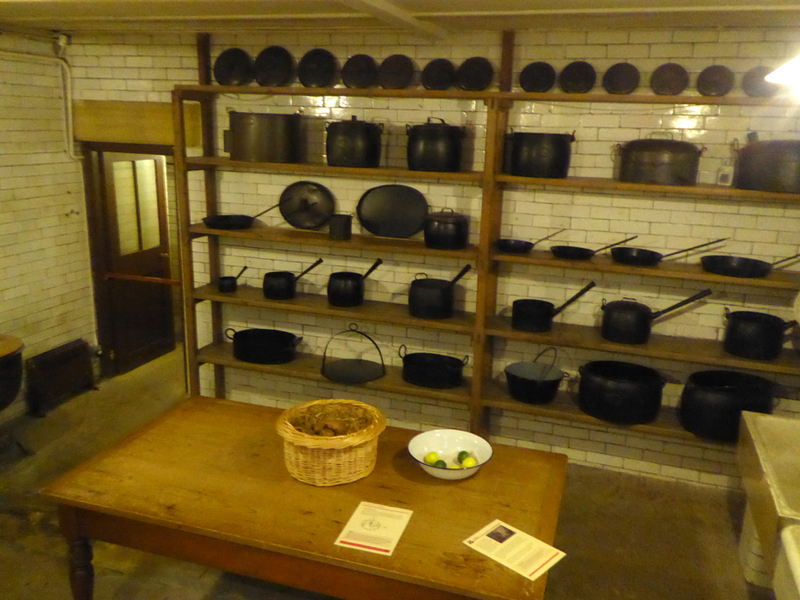 A wider view of the kitchen and the displays. 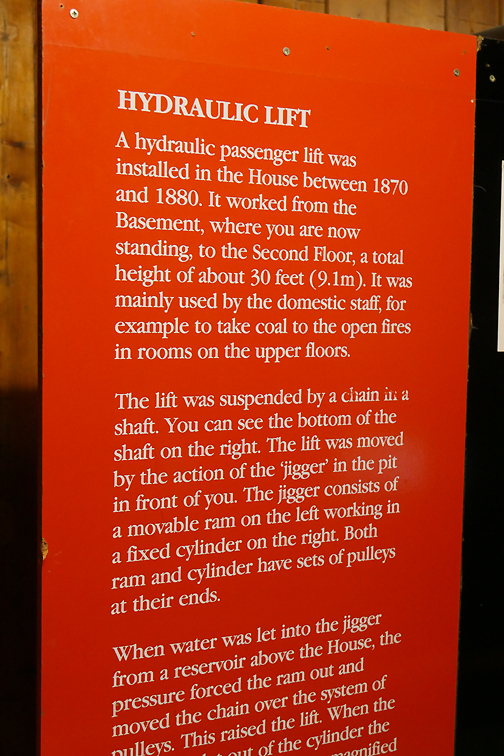 The pot racks mentioned in the leaflet above. 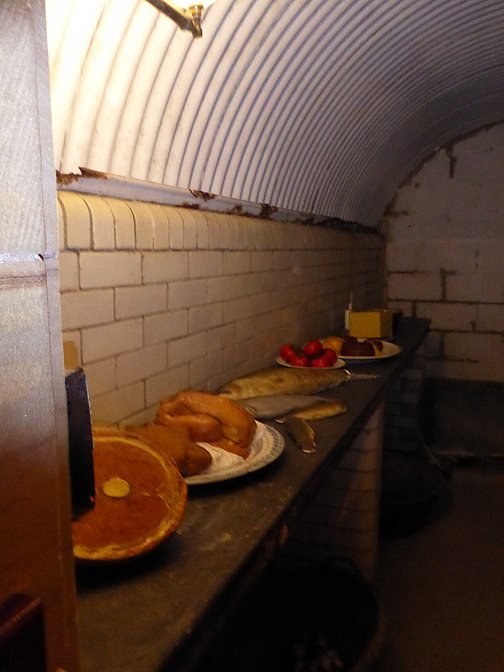 The Game Larder . 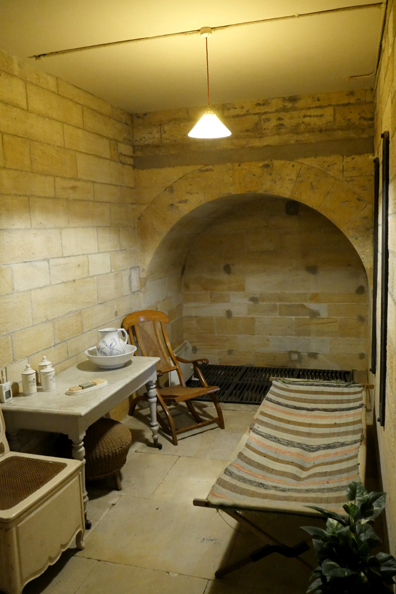 . . an underground cool room. 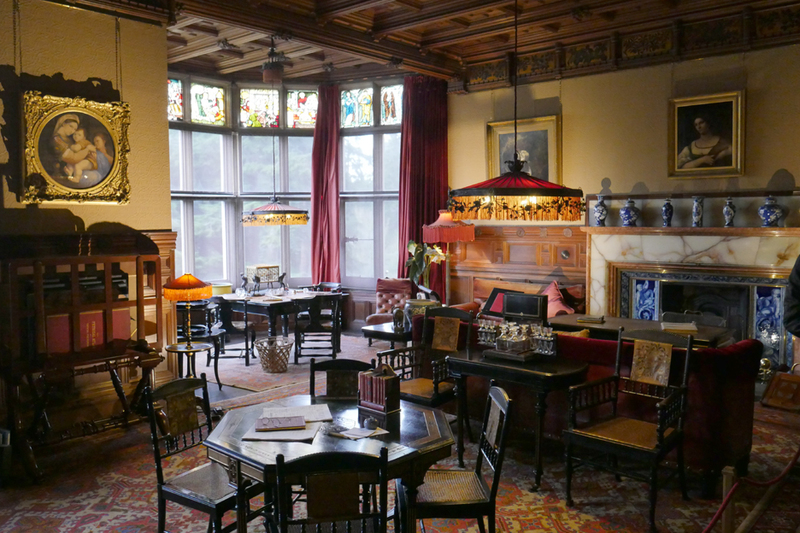 Technical innovations were a feature of Cragside . 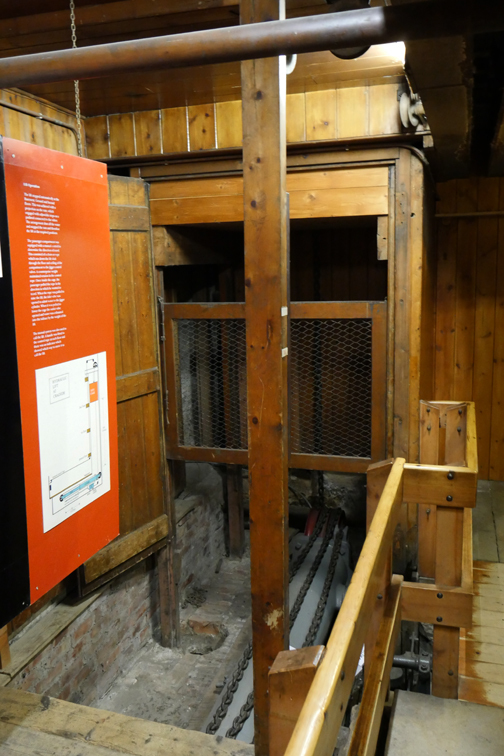 . . here an hydraulic passenger lift. 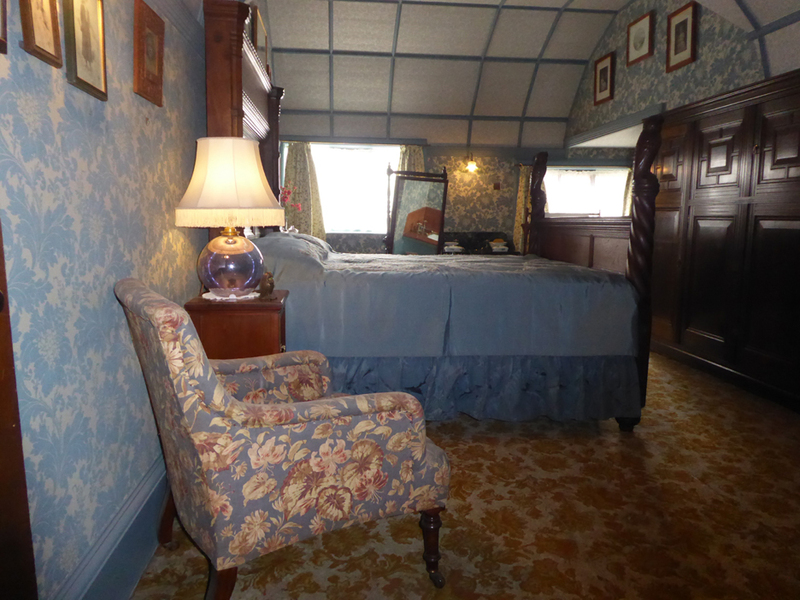 Upstairs we visited the grand bedrooms . . .
. . . each with their own seating area. 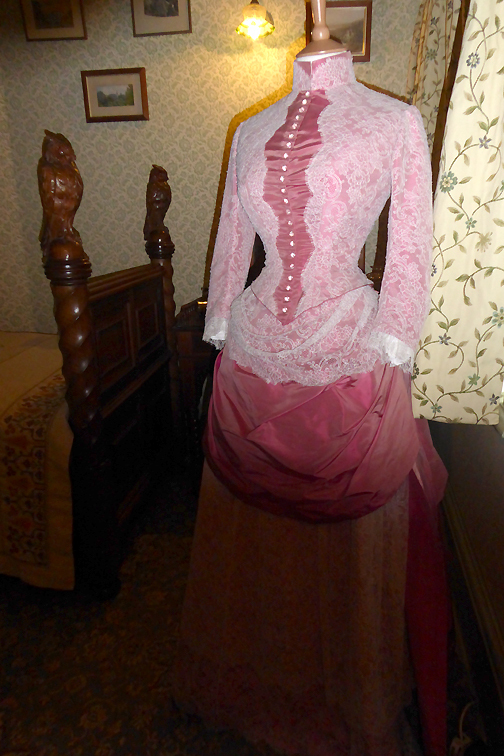 One of several dress displays. 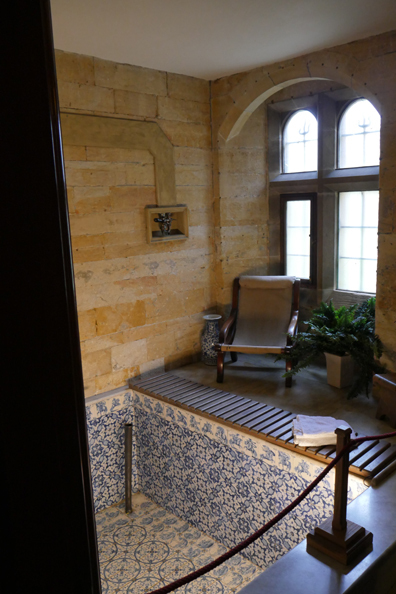 Very modern bathrooms for their day . . .
. . . a plunge pool for indoor bathing . . .
. . . and a sauna room heated via the rear floor grill. 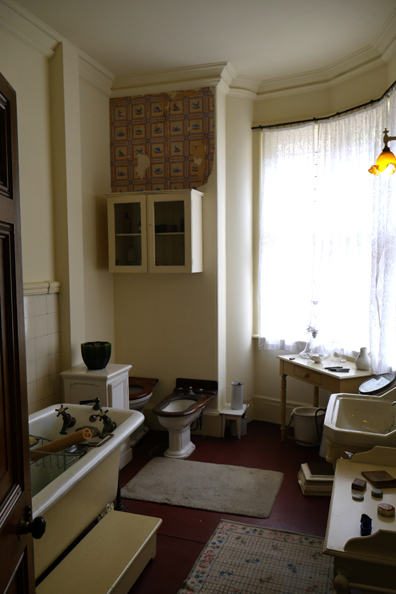 Upstairs from the main entrance was a grand corridor. 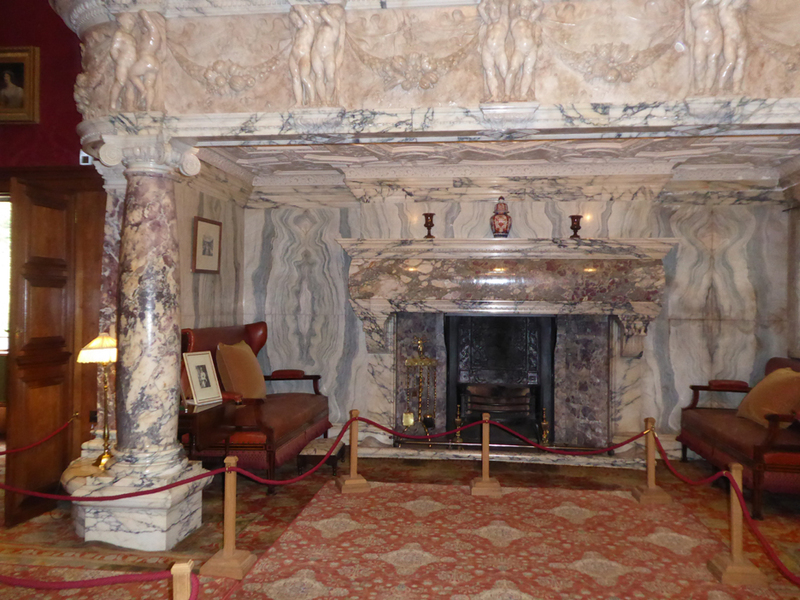 and the famous Cragside Italian marble fireplace. 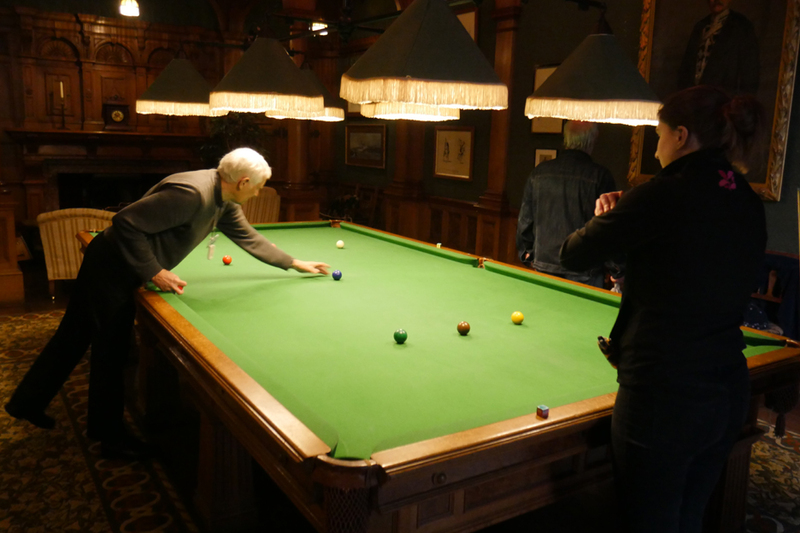 Behind the main room was a billiard room where staff were just testing that the equipment was still in working order. 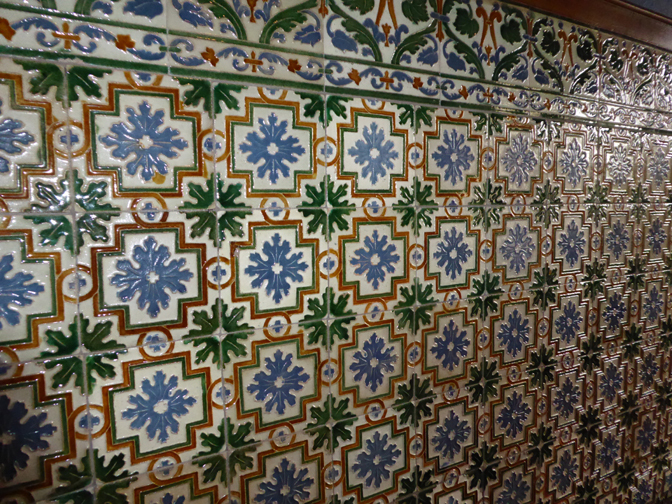 Detail from some of the ornate tile work in the main corridor. 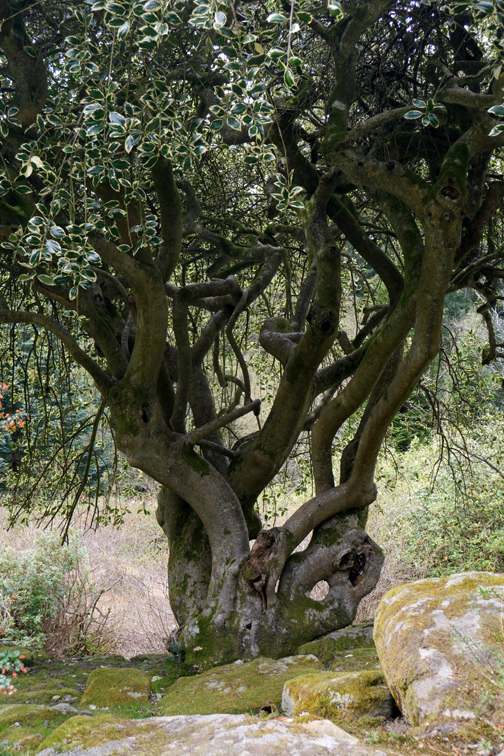 Whilst Ann was inside I had a short walk around . . .
. . . finding this gnarled holly tree in the rockery. 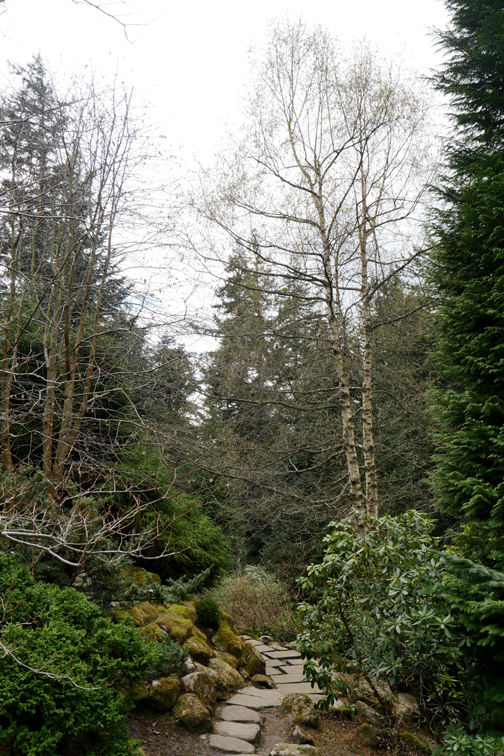 A view back up to the house . 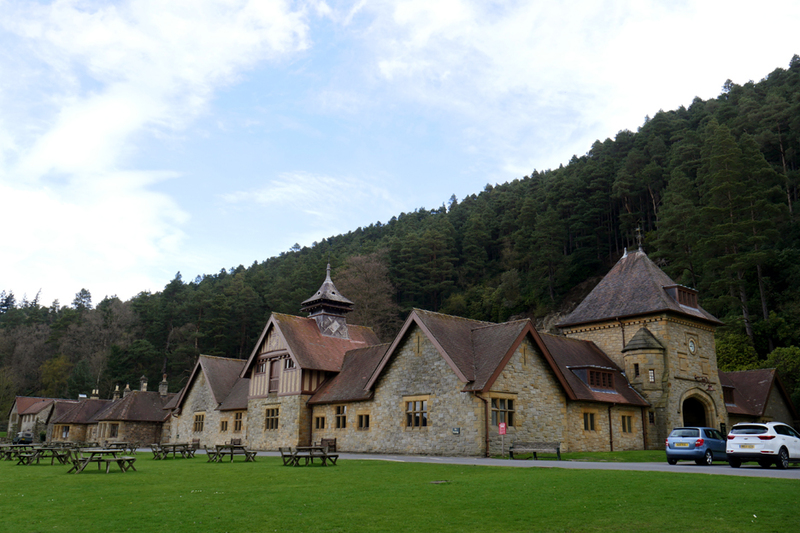 . . a most impressive building in such a wonderful setting. Time to be heading back to the car . 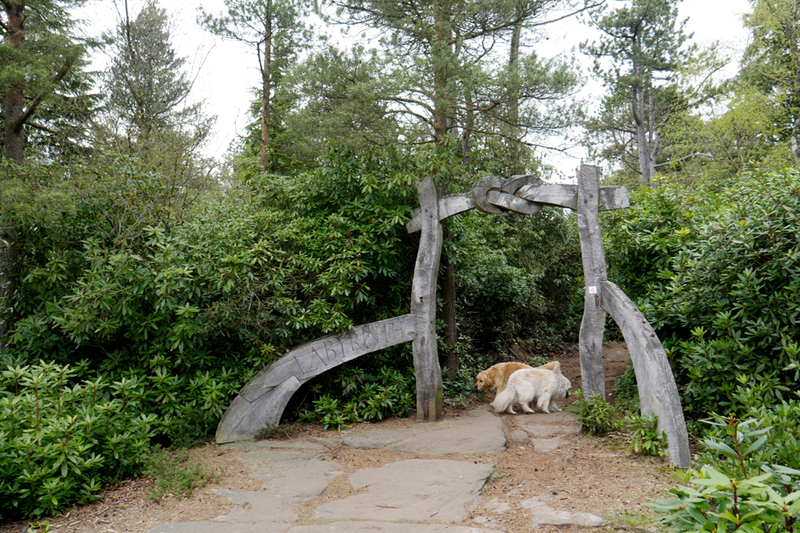 . . in order to experience the six mile drive around the "Carriage Trail". From the car park the route took us through the courtyard arches . . .
. . . and out onto the forest roads around the estate. 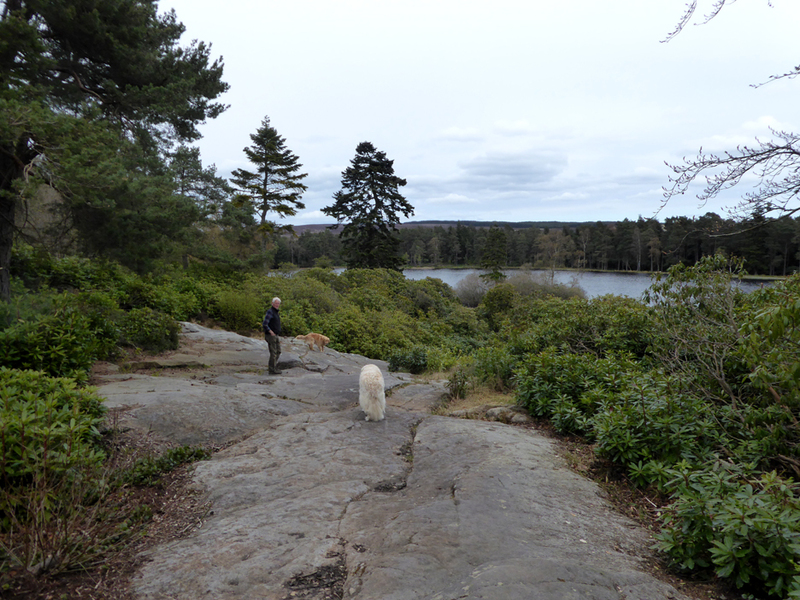 A brief stop at Cragend Quarry . 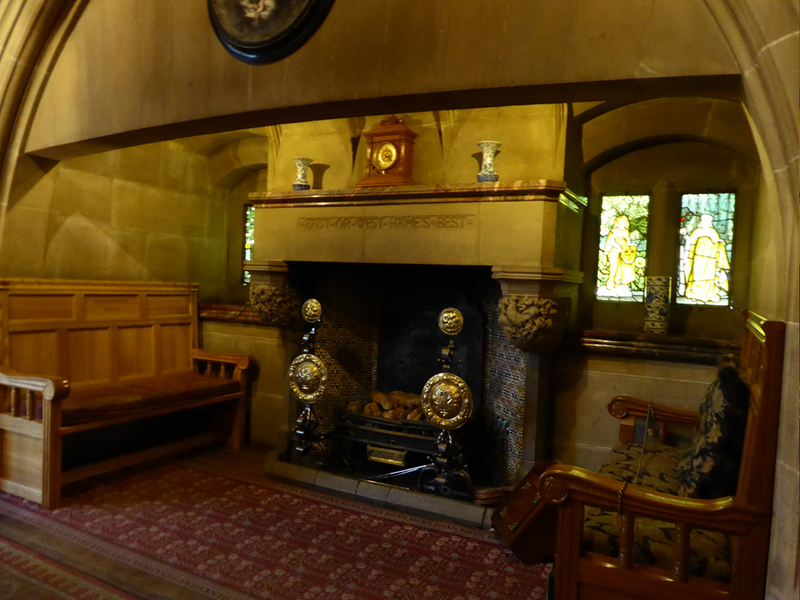 . . presumably the source of much of the stone used for the house. The incongruous thatched boathouse on the now-drained Blackburn lake. 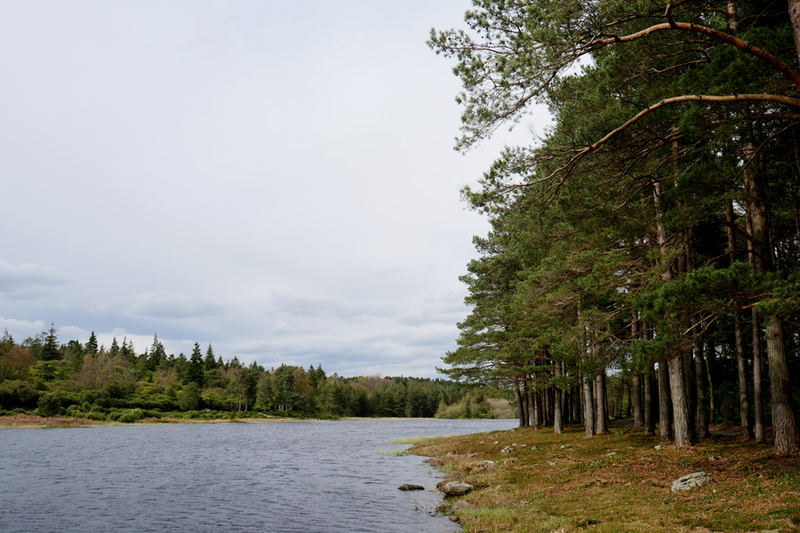 The road took us on around the Nelly Moss Lakes. 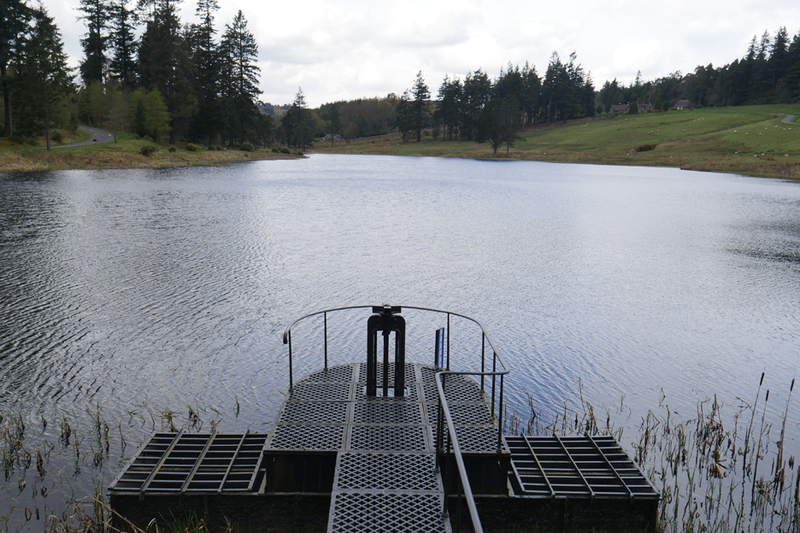 These are artificially raised lakes and water from them was piped down and used to provide hydro electric power for the main house. The view up the length of the South Lake. 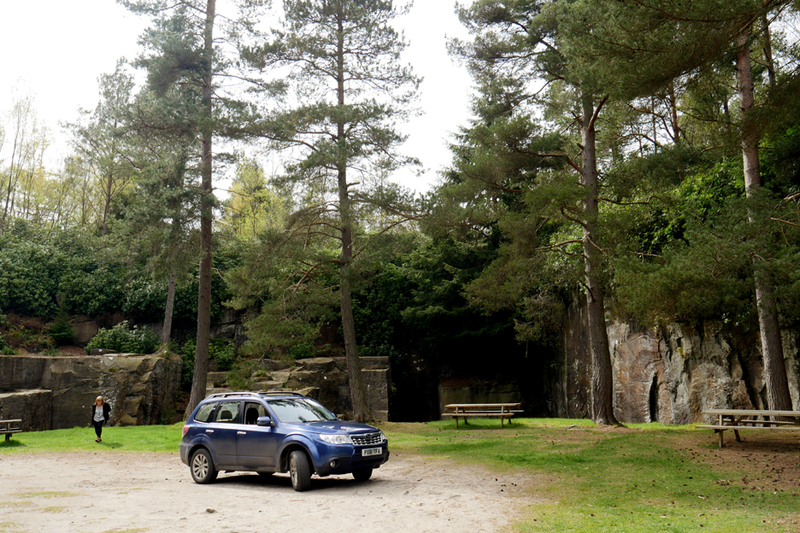 We stopped again at the Nelly Moss car park and explored the vast area of rhododendron forrest.
" 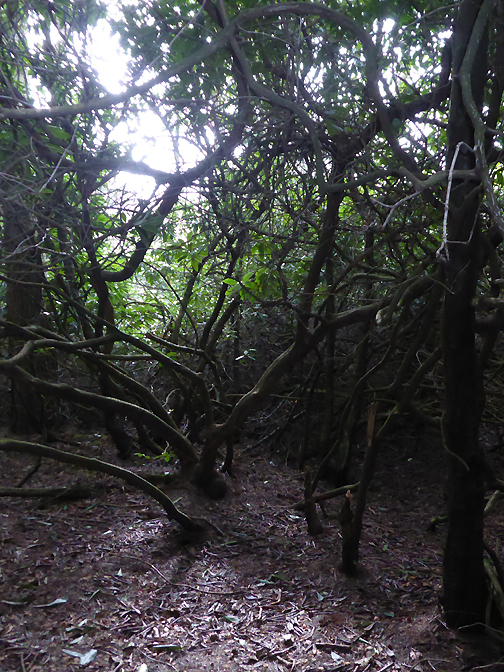 Welcome to the labyrinth"
Dark hidden places . . .
. . . and surprising finds. Once bare moorland, now a Himalayan landscape. 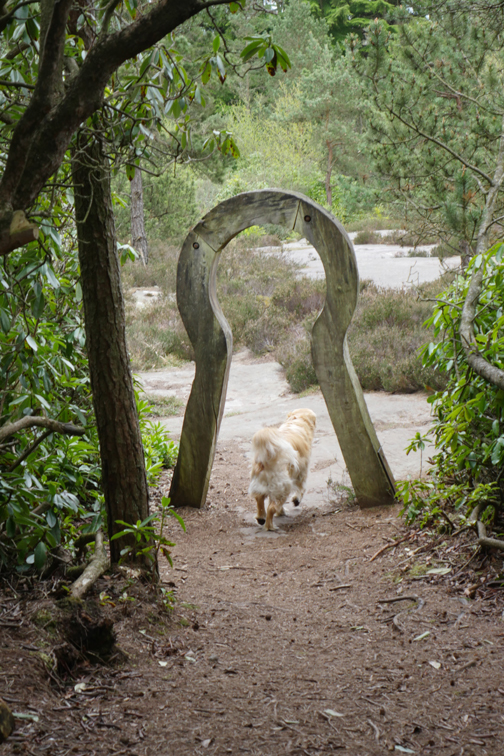 We find the key to exiting the woodland. across one of the many rock slabs. set alongside the water's edge. and just stretch your legs if you wanted. Nelly Moss North Lake from the boathouse. The circuit brought us back round to Tumbleton Lake . . .
. . . and to the Visitor Centre we had walked to earlier. 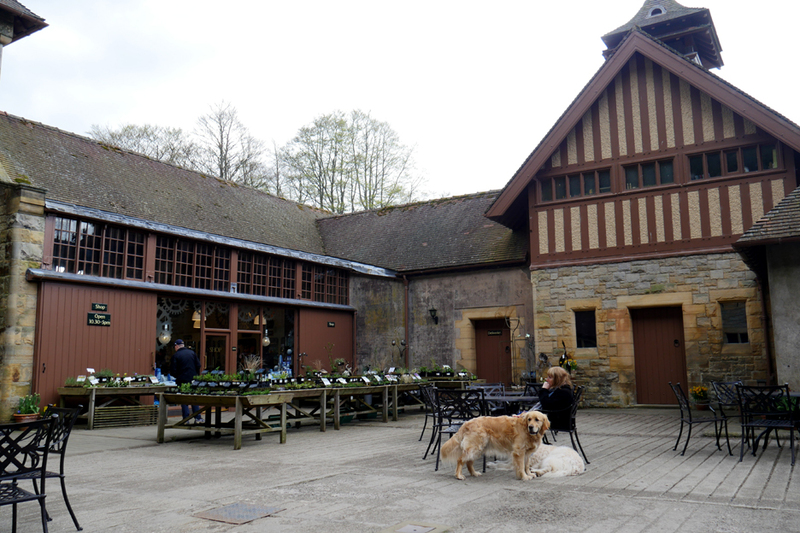 but as we were so close we decided to call into Rothbury Village before we did. 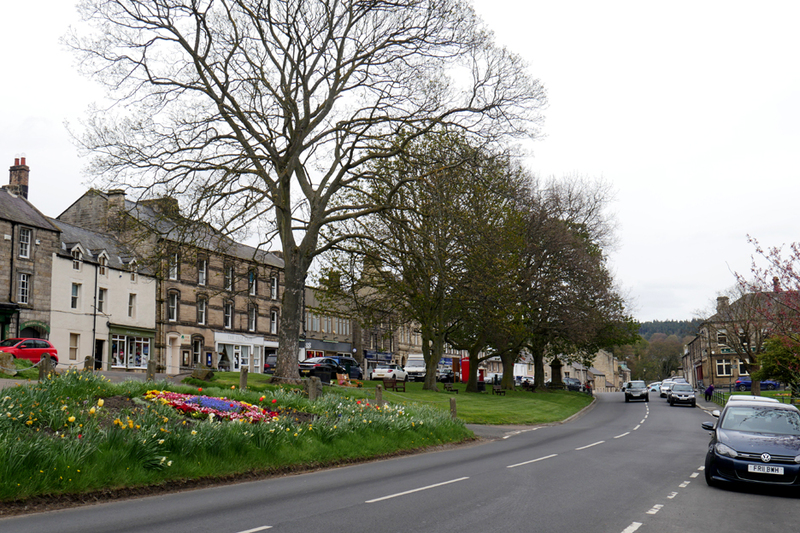 Rothbury is a thriving little town with a lovely green heart. Being reasonable commuter distance from the Newcastle conurbation, there was quite a lot of new, tasteful development too. We took the opportunity to pick up a few supplies for the remainder of our self-catering holiday week. 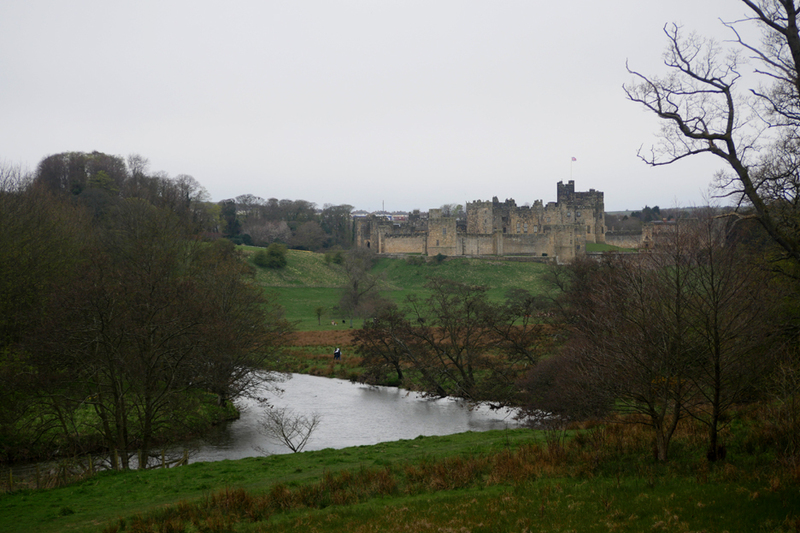 A view of Alnwick Castle as we drove back in rather poorer weather . . . the first of the week. 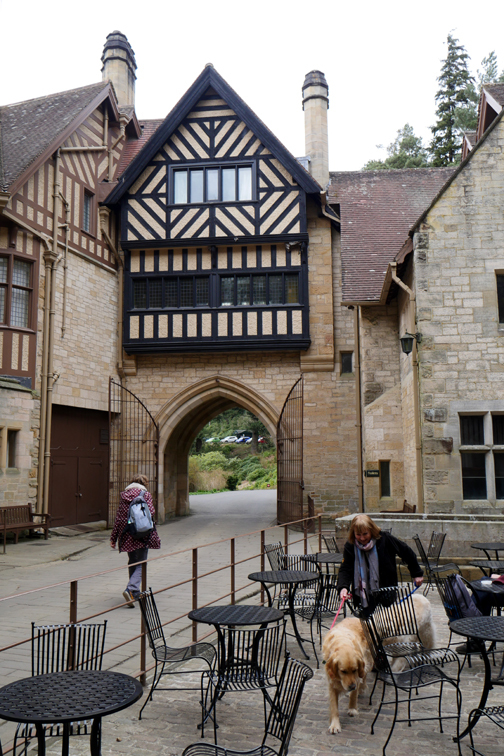 but best seen from a slow drive through town or by making a separate visit to the castle. Your latest post was a real meander through my past. 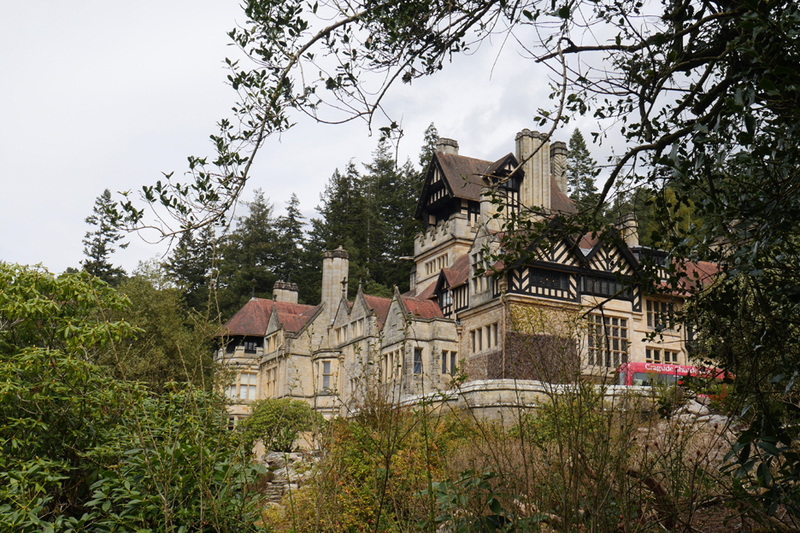 My mother-in-law used to run Cragside for the National Trust and Amy and Robert spent many a holiday exploring the house (which she lived in) and grounds. 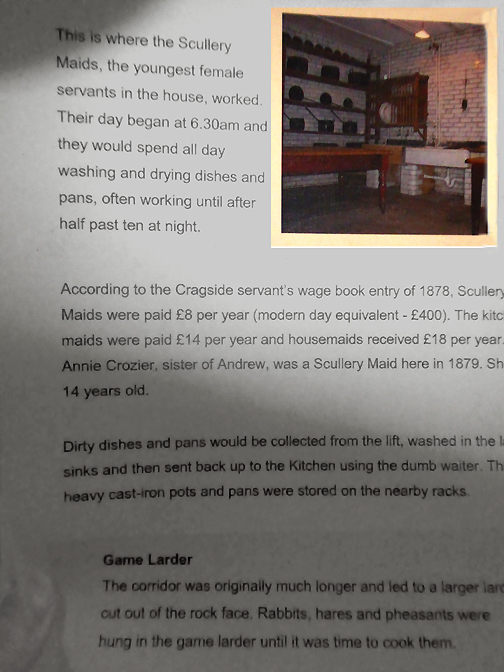 After she retired both her and my sister-in-law had cottages in the grounds and Robert even did two weeks work experience there when he was 17/18. 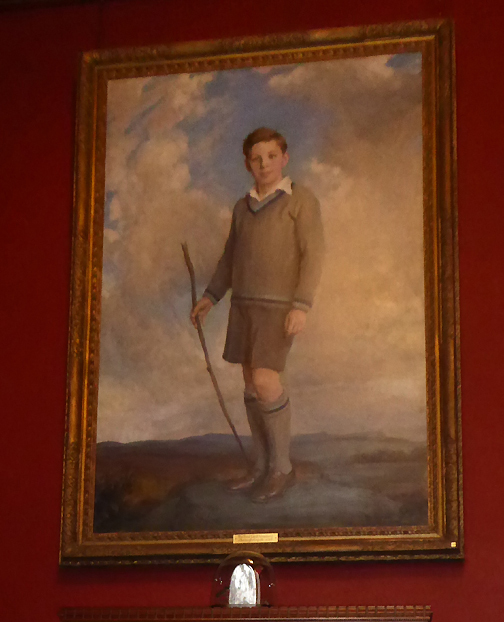 He did have an offer of a job up there but at 18 didn't want to leave home and his friends to start a life in Northumberland. 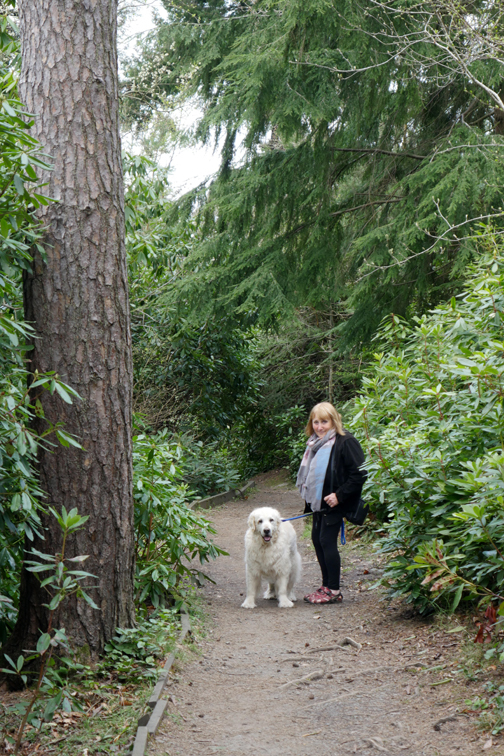 She has since moved down south to be closer to her grandchildren so it is some time since I have seen the grounds etc. although nothing seems to have changed that much. 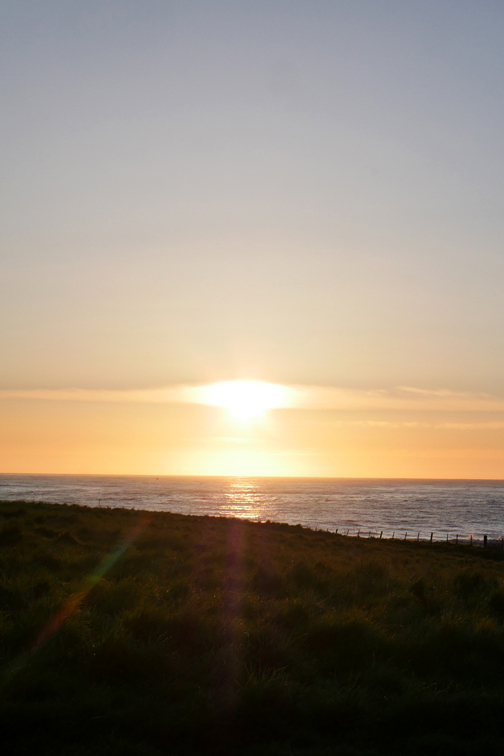 Thank you so very much for sharing your holiday pictures with us, particularly Northumberland 4. It must have taken you quite a lot of time, to put it all together on your website for us to enjoy. 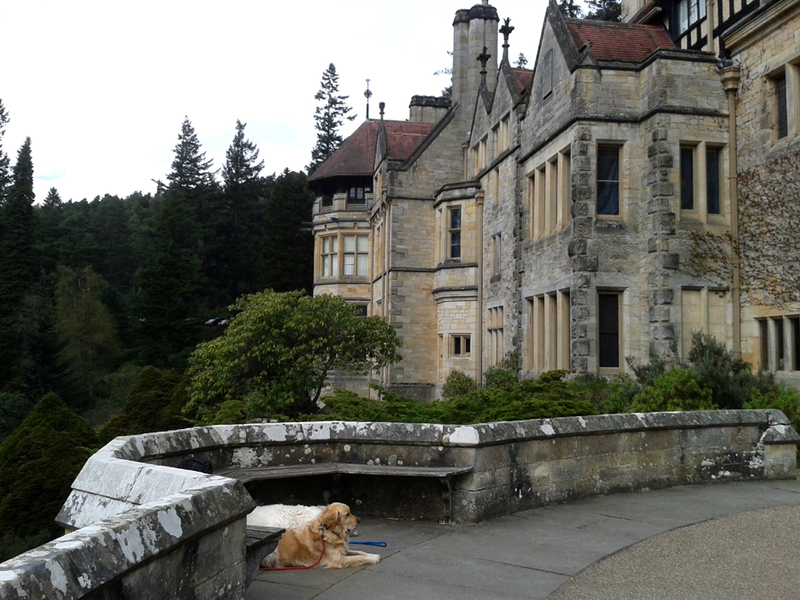 The Cragside House & grounds are amazing, beautiful, unique and informative. Wish we had known about it, when we were in England. I concur with the other comments. Such a pleasure to go on a pictorial holiday with you. I have just finished the Toby Clements ‘Winter King’ series so it was wonderful seeing the Dunstanburgh ruin. 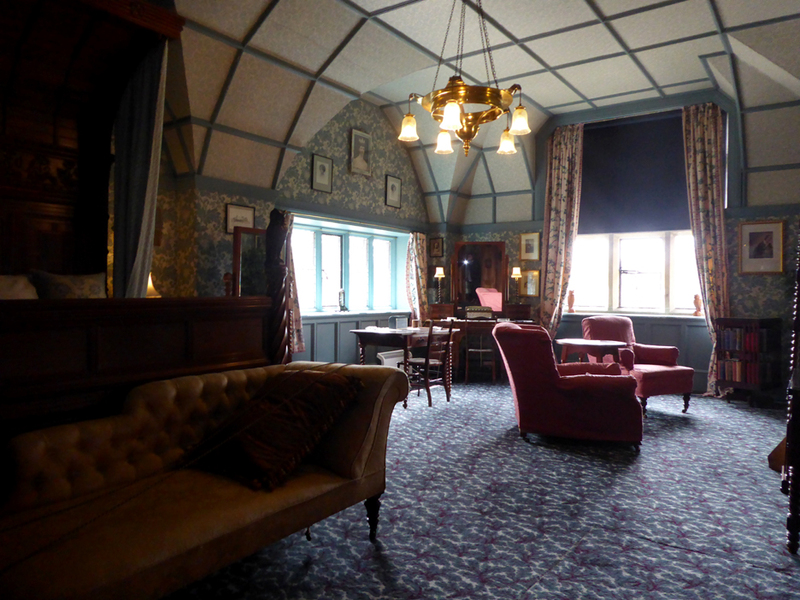 I have been to Alnwick Castle, and Bamburgh Castle – all feature in his War of the Roses historical fiction. There was much blood shed in this part of Beautiful England. 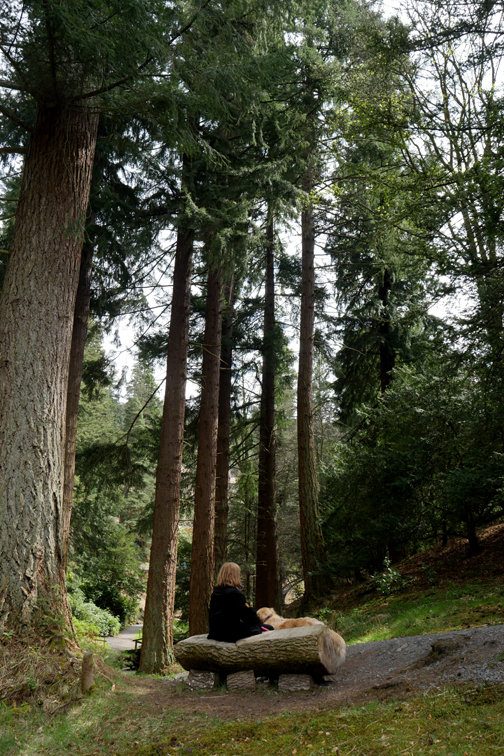 Could the very tall pine trees be sequoia’s – Californian Redwoods? 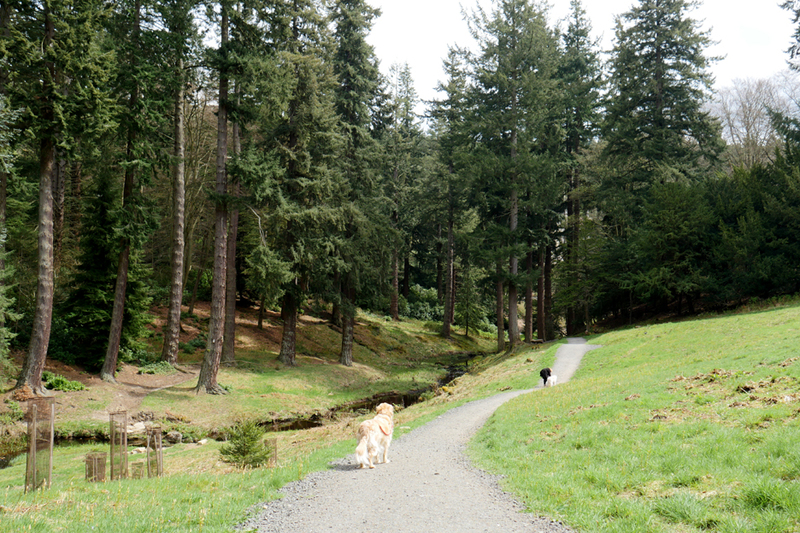 We saw them in the Bodnant Garden and they are truly awesome even at only 200 years old. 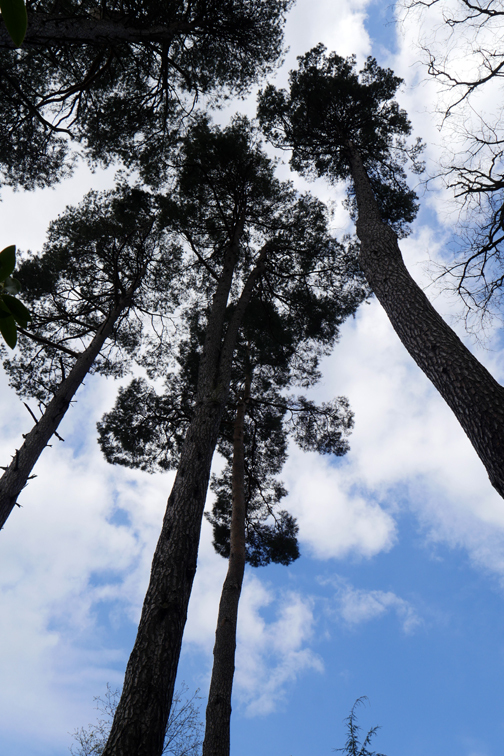 Canberra has an arboretum with a whole grove of these trees – most only 2 metres and 10 years old, lots of room for growth. 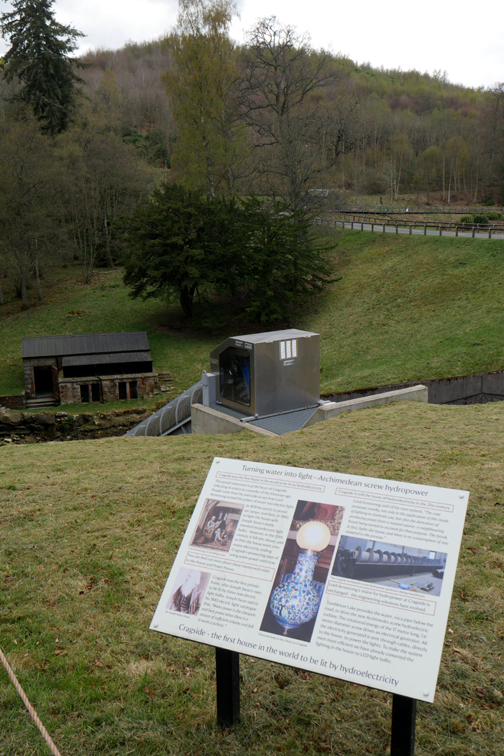 We enjoyed the engineering displayed - and hope to visit Cragside one day and see the first hydro-electric scheme. It was very interesting. 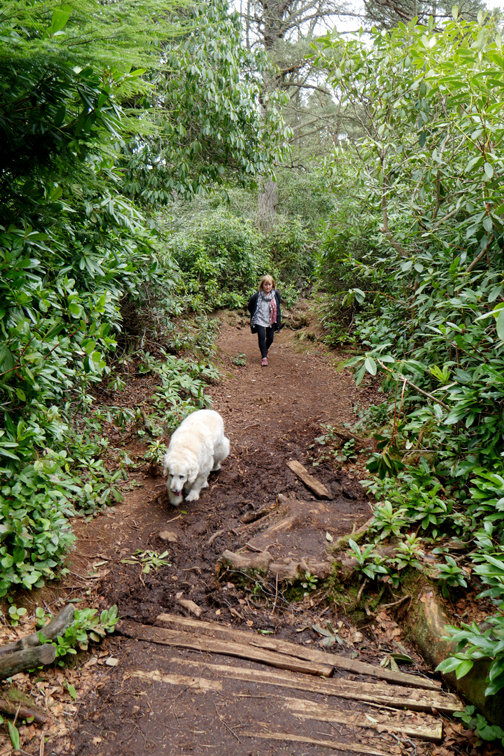 The rhododendron wilderness looks to be a problem. We have seen programs where they are trying to remove it. Thank you for your wonderful walks and photos, I rarely miss one, my lunchtime treat. I look forward to seeing the hedge and fruit trees grow and the grasses fill in round the pond. Have you got tadpoles? You will enjoy hearing the frogs at night. Grace and peace, Susan Phillips. NSW. This site best viewed with . . . a local map and tourist leaflets to explore the area. 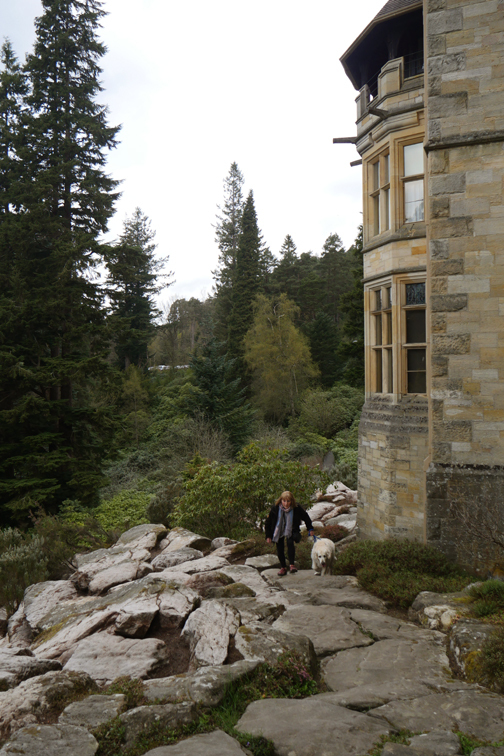 A previous time in the area - This is the first time to Cragside for us so there are no previous pictures to refer to.